The Jousting Life: Joram van Essen Wins "The Grand Tournament in Sankt Wendel"
Joram van Essen Wins "The Grand Tournament in Sankt Wendel"
Thanks to a little help from his friends, Joram van Essen has won the "Great Honor Award" (tournament championship) for "The Grand Tournament in Sankt Wendel". 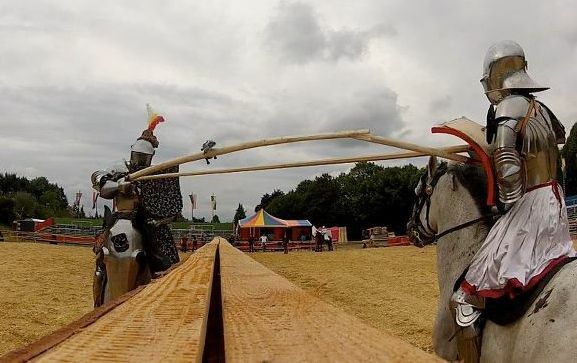 Even though he was injured and unable to complete the tournament, Joram won the tournament championship with a total of 103 points, 12 of which his fellow competitors took from their own scores to give to him. 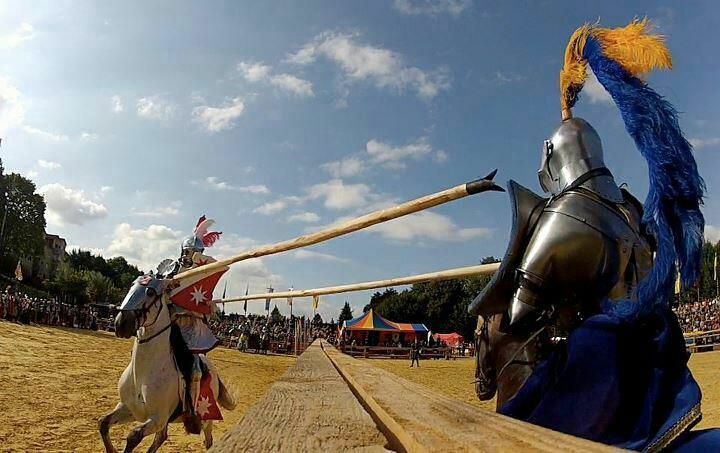 The final 5 points which put him in the lead came from Arne Koets, the jouster he was competing against when he was injured. This act of chivalry put Arne Koets in second place overall. "Arne weiß, was er damit getan hat. Das war absolut beeindruckend"("Arne knew what he was doing. This was absolutely incredible.") stated Joram van Essen. Arne won this dagger and knife set as the "Prize for Highest Bravery"
Andreas Wenzel was the "Winner of the Joust of the Squires"
Andreas won this dagger and knife set as the "Prize for the Joust of the Squires"
Joram van Essen was too injured to don his armor for the awards ceremony, so he was wearing his "soft kit", a red houpelande, when Tournament Master Wolfgang Krischke awarded him the beautiful sword that was the "Prize for Great Honor". Many thanks to Ben van Koert for sharing still images from his GoPro video cameras. Much of the information in this article was based on information from a translation of the article,"Ein Sieg der Ritterlichkeit" by Ulrike Otto in the online newspaper "Saarbrueker Zeitung". 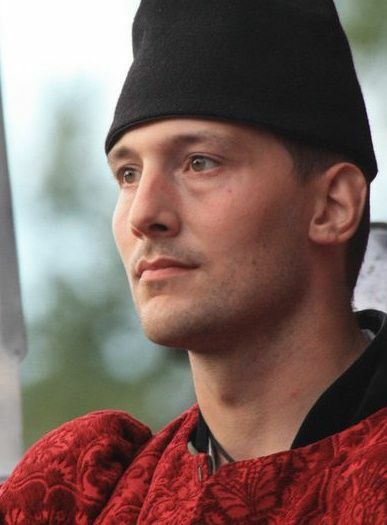 The 'unknown person' holding the sword was the Turniermeister (Tournament master), Wolfgang Krischke. He is the main man of the Fürstliche Hofreitschule Schloss Bückeburg where Arne Koets now also is working, teaching classical / baroque dressage as one of the few around the world. Thank you Bertus! I thought that might be who it was, but I wasn't sure. I'll update the caption. I am so happy I stumbled upon this blog. it's amazing to see the different events, read the interviews and so on. I'm learning so much and it's awesome to see this sport at a more professional level. Absolutely love this blog.